One of Mexico’s most emblematic and economically important plants is the poinsettia (Euphorbia pulcherrima). After nearly 200 years of poinsettia cultivation outside Mexico, more than 300 varieties of many different sizes, shapes and colors have been generated. 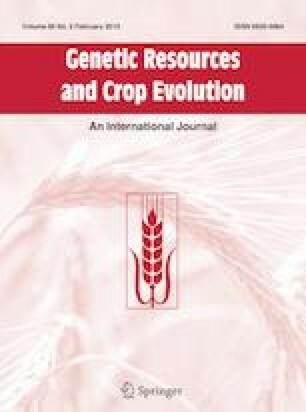 However, studies on the management of or the evolutionary processes through which the changes present in cultivars have been generated, starting from wild plants, have not been carried out. In the present work, we tested the hypothesis that poinsettia plants living in human settlements represent transplanted wild plants. To test this hypothesis, we analyzed the genetic diversity and kin relationships of 58 poinsettia plants from 25 wild populations, 25 garden plants and 8 Mexican and foreign cultivars. Two non-coding intergenic chloroplast markers, trnG-trnS and psbA-trnH, were utilized to obtain the diversity indices and genealogies. The results support the transplanting of poinsettias hypothesis because garden plants share the same genetic variant as the wild populations and, in most cases, that of the closest wild populations. Some garden poinsettias have simple inflorescences, like the wild plants. The garden plants have a genetic diversity that is higher than in cultivars and that is shared with nearby wild populations. Additionally, some homeowners indicated that their plants were obtained from nearby hills. The transplanting of wild poinsettia plants to human settlements could have been one of the first steps in the domestication process of E. pulcherrima. Also, new genetic variants were found; one of these could be Euphorbia fastuosa, an invalid name for E. pulcherrima proposed by Sessé and Mociño between 1787 and 1803. We thank Funded by National Geographic Society for Grant 8710-09 2006 and CONACYT Support for the Strengthening and Development of the Scientific and Technological Infrastructure for grant 26,866. Laura Marqués of the Biodiversity and Health Genomic Sequencing Laboratory of the Institute of Biology, UNAM, is also thanked. Lastly, we are grateful to Angélica Cervantes Alcayde for her support with the laboratory work.